This is the time of year when our farm market gets its hatches battened down and the corn wagons are parked for the winter. Our late summer planting of winter cover crops of rye and oats and clover are well established and we can seriously think about the quieter winter months. One of the final late fall jobs is to uncover the big piles of straw in the berry fields and chop the bales over the strawberry plants to protect them from the very cold winter temperatures. That same straw will help keep the weeds controlled, the berries mud free and make it nice for picking next summer. Seems so far away doesn’t it? I know that each year many of our farm market customers stock up on as much Ontario produce as they can when the market closes at the end of October. I am pleased that this year we will be offering as long as we can, Ontario fresh and preserved fruits and vegetables at Reesor’s Market & Bakery in Stouffville, so that we can all continue to eat as locally as possible, year-round. Are you starting to think about Christmas gift-giving? Whether you want to send multiple corporate gifts, a box of pantry items and treats for grandparents, a hostess gift or are looking to surprise the food lover in your life, our selection of gift boxes will leave everyone smiling. You can pick from our selection of pre-packaged gift boxes in various sizes and price ranges including cookies, preserves, breakfast treats, coffee, tea, snacks and more. This year we are proud to introduce our new signature, chocolate brown gift boxes. These gift boxes are re-useable or recyclable and the cushioning material in the box is also recyclable–there is no plastic waste. You’ll also be smiling because these boxes are very easy to carry. If you place an order for a gift box at the Open House your name will be entered in a special draw to win a “Weekday Breakfast Box” a $40 value. Our complete selection of gift boxes will be on display at Reesor’s beginning Fri. Nov. 22 at our Open House. 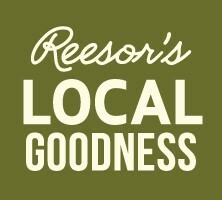 Our bakers, cooks and staff at Reesor’s are always thinking about new foods to make your life tastier and easier. Our Open House is a way for you to try out our new foods, enjoy classic favourites or to taste something that you haven’t tried before. We’ll have extended hours on Friday Nov. 22 from 9:00 a.m. to 8:00 p.m., so you can stop in when it’s convenient for you during the day or on your way home from work or after dinner. There will be lots of food to sample including our traditional Quebec tourtiere and other hot and savoury foods. We’ll be launching and sampling our array of Christmas cookies and cakes for 2013 if you want to start stocking your freezer or cookie tins for your holiday entertaining and gift-giving. Be sure to enter the lucky draw, and if you order or purchase a gift box that day you can enter an additional draw to win a gift box. So, mark the date on your calendar and come on in for the fun.